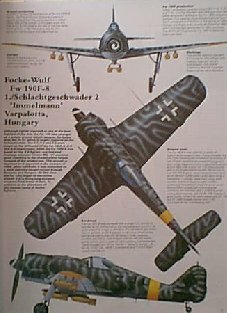 The Focke-Wulf FW-190 was conceived as a "backup" to the Messerschmidt ME-109. The feature that really allowed it to go forward into production was the radial engine it used, which was not in high demand (as opposed to the inline the 109 used.) Strangely enough, while the 109 fought to maintain parity with the other fighter/interceptors of its time, when the FW190 was introduced it outclassed everything else in the sky, and maintained its competitiveness until the end of the war. The FW-190 was a powerful, rugged aircraft, with enough stretch in its airframe to take on many roles - fighter, bomber destroyer, and in the F series it took over for such venerable (and now vulnerable) aircraft as the JU-87 Stuka in the ground attack and close support roles. You could find FW-190s armed with 250 or 500 kg bombs, anti-personnel "bomblets" and the like - and with the ability to attack or defend itself with two 13mm machine guns and two 20mm cannon, it was a potent aircraft indeed. I've liked the FW-190 for a long time. It's one of those aircraft with that "certain something" about it. When Monogram had their "multiple variant" kit out years ago (now rereleased in the "Monogram Classics" series) I snapped it up, and couldn't wait for the rerelease late in 1999. 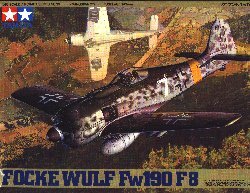 It does, however, show its age in some respects of fit and detail, and portrays only the "A" series of the FW-190. Tamiya, while not having as "flexible" of a kit, has a much more detailed version of other marques. Once I saw a color plate in Wings of Fame of an FW-190 F-8 stationed in Hungary, I knew I had to model it. This desire is easily fulfilled with a Tamiya kit - though the markings for the specific aircraft are not there, most of the ones you need are, and come with a kit with the promise of great fit and ease of assembly Tamiya is famous for. Upon a close look at the kit, the flexibility in the kit is made apparent. There's a good choice of armament, both type of canopy are available, and Tamiya has even noted in the instructions where to "trim" the landing gear covers if appropriate for your aircraft (which it is for mine.) This was done on the real aircraft to help cope with muddy, unprepared fields - something that FW-190F's of the schlactgruppen had to contend with quite often. 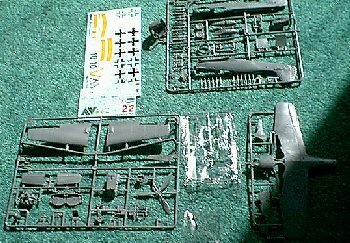 The kit gives you several markings choices, all from the Schlactgruppen: one in a desert scheme from 2/SG4, based in Italy (1944,) one from 1/SG2, Hungary (the same Gruppe as the aircraft I wanted to model, from about the same time,) one stationed in Berlin in 1945, and yet another 1/SG2 from Hungary (1945) with a very similar disruptive scheme to the aircraft I chose to model.